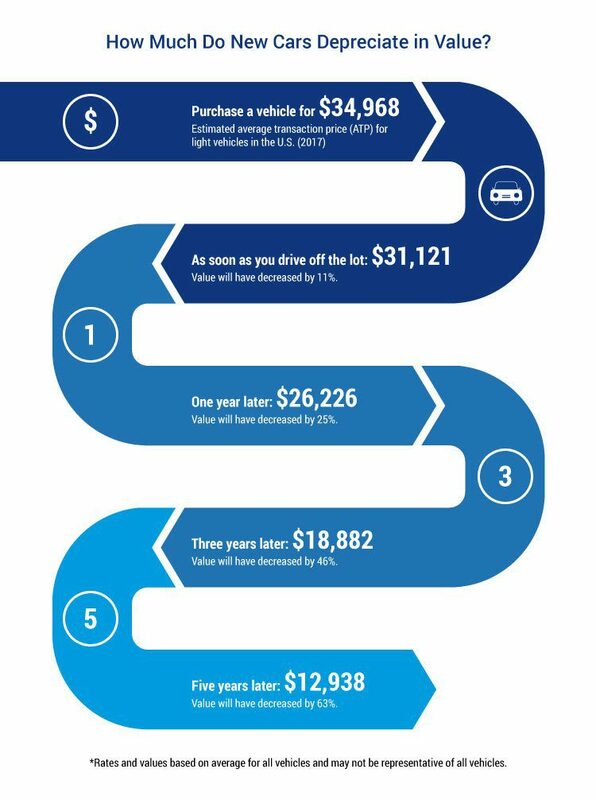 When buying a car, you have to be prepared to lose money… Over time. No one wants to throw money away, and whether or not you will do that with car purchase is up to you and your negotiation skills and the amount of preparation you’ve invested prior to buying a car. But, one thing is for sure – cars tend to lose in value as time goes by and start as soon as you drive them off the dealer’s parking lot. New cars usually lose around 11% in value as soon as you take them off the dealer’s lot and by the end of the first year of driving, its value has decreased by 25%. However, the good news is that after that first year, the vehicle will lose its value more slowly, but will depreciate nevertheless. The average depreciation rate in the first 5 years is between 15% and 25% per year. However, the problem arises when you have NEGATIVE EQUITY – when your car is worth less than the amount of money you owe on your car loan. For example, if you bought a new car at a purchase price of $31,300 (plus taxes and fees cost an additional $3,700), you paid for the car with a $35,000 car loan with an interest rate of 4% for an 8-year term. With a depreciation rate of 40%, your car would be worth $8,520 less than what you owe on your car loan. However, it’s important to underline that the longer loan term makes it harder to get out of a negative equity situation. 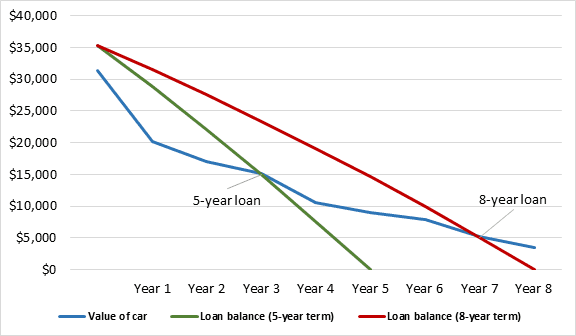 A comparison of negative equity situations on a $31,300 car with a 4% interest rate gives different results if the car loan is for 5 years and if it’s for the 8-year period. With a 5-year loan, you would begin accumulating POSITIVE EQUITY (when your car is worth more than what you owe on your car loan) towards the end of the 4th year. By contrast, with an 8-year loan, you would be in a negative equity situation up until the 7th year of your loan. Moreover, NEGATIVE EQUITY tends to be higher in the first 2 years of a car loan because cars depreciate quickly in the first year of use. Remember, a larger portion of each of your regular loan payments goes towards interest in the first few years. 1) Selling: If something unexpected happens and you need to sell your car quickly, you may lose money. If your car is worth less than the amount you owe on your loan, you might have to borrow money to cover the difference between what you can sell your car for and what you still owe on it. 2) Accidents: If you get into an accident and your car is a total loss, the money you get from the insurance company may not cover what you still owe on your car loan unless you have extra insurance coverage. For example, if your insurance company decides the replacement value of your car is $10,000, but you still owe $16,000 on your loan, you will need to cover the $6,000 shortfall. 3) Trade-ins: If your car is worth less than the amount you owe on your loan and you trade in your car at a dealership to buy another, you may end up paying a lot of extra money. You might need to borrow to pay for the new car and cover the amount still owing on the old loan, which could add up to a larger loan and more interest charges. In turn, this could result in even more negative equity. 1) Gas Guzzlers: Vehicles that get lower MPG tend to fall out of contention due to the extra cost and guilt. 2) Luxury: Cars that were built for showing off tend to lose most of their shine within the first few years. 3) Longevity: Cars that are not known for their reliability tend to depreciate quicker. 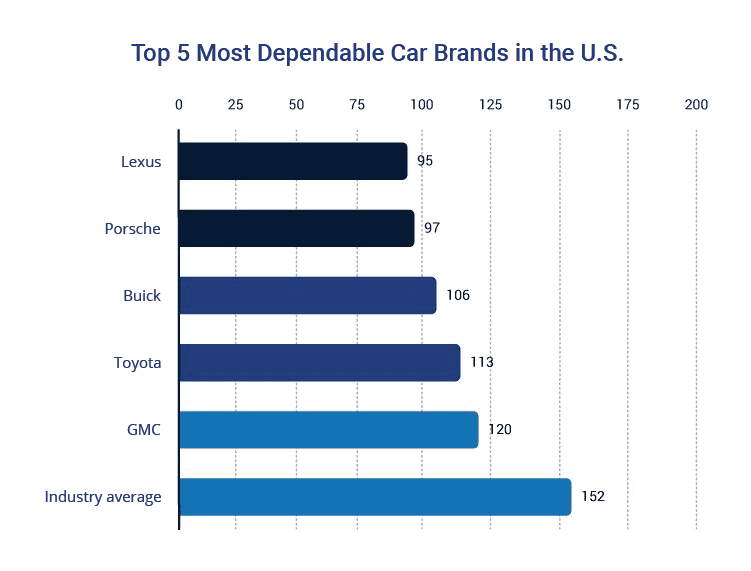 According to TrustedChoice, the most dependable car brands in the US (and Canada is not far off) are Lexus, Porsche, Buick, Toyota and GMC. 1) Buy a used car (3-5 years old): Let the previous owner eat the depreciation. 2) Wait: Once a car hits 10 years, depreciation is no longer a factor. 3) Maintain the value: Keep your service records up-to-date and repair any damage quickly. 4) Buy smartly: Choose a popular color and options that will add value to your car if/once you choose to sell it. 5) Low mileage: Keep your miles down as much as you can to help increase resale value. CRS Automotive is an OMVIC-certified dealer, so come to Oakville today and buy a car from us. Also, if you want to slow down the depreciation on your car, come to your trusted mechanic in Hamilton and Oakville and we will take care of your car.